K: Have you read the email that Joe sent this morning? D: No, I haven’t even gotten a chance to turn on my computer yet. K: Joe announced that he has left the company! D: Oh wow, what a surprise! That’s too bad, as I have really enjoyed working with him. The Present Perfect Tense is used when an activity has started in the past and continues into the present. Below, you’ll see many examples of positive, negative, and interrogative present perfect sentences. Read them out loud with your tutor. I have studied for the exam. You have bought a new computer. He has eaten my chocolate. She has written an e-mail. It has been cold this month. We have won the championship. You have tried to learn a lot. They have forgotten my birthday. Exercise: Now try creating a positive present perfect sentence yourself. I haven’t studied for the exam. You haven’t bought a new computer. He hasn’t eaten my chocolate. She hasn’t written an e-mail. It hasn’t been cold this month. We haven’t won the championship. You haven’t tried to learn a lot. They haven’t forgotten my birthday. Exercise: Now try creating a negative present perfect sentence yourself. Have I been chosen for the team? Has he eaten my sandwich? Has she written the letter? Has it started on time? Have we won a trophy? Have you kept my secret? Exercise: Now try creating an interrogative present perfect sentence yourself. You may have noticed that the present perfect sentences above all use past participles. 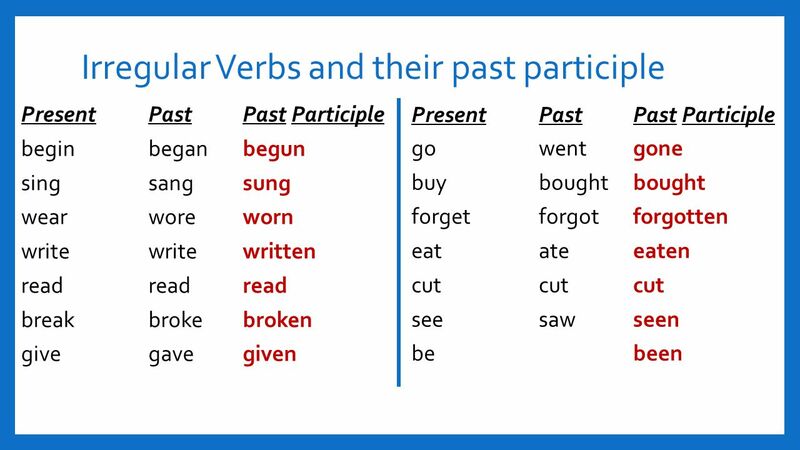 Past participles are verbs that end in “ed” (most of the time). Sometimes however past participles are irregular. Make a positive present perfect sentence using the words. I / study / English I have studied English. He / live / here / for three years (1) _________________________________. John / teach / English / in Bogotá, Colombia (2) _____________________________. My parents / miss / the train (3) _______________________. You / eat / all of the cake (4) _______________________________. Make a negative present perfect sentence using the words. John/finish/his homework John has not finished his homework. They / buy / a house yet (5) ___________________________. We / go / on a vacation in three years (6) __________________________________. His friend / work / for one year (7) _________________________________. Her boyfriend / graduate / from the university (8) __________________________. Make a present perfect interrogative sentence using the words. The Chinese students / visit / the USA? Have the Chinese students visited the USA? How long / your mother / be / sick? (9) ________________________________. What / you / do / today? (10) ______________________________. John / talk / with his mother today? (11) ________________________________. Using John’s Life Timeline above, make present perfect sentences using the words. Some of the sentences are questions. John / achieve / his CELTA certification in Bogota Colombia John has achieved his CELTA certification in Bogota Colombia. He / graduate / from high school? (13) _____________________________. John / live / abroad in Chile? (14) __________________________________. He / work / for Warner Lambert (15) _________________________________. John / complete / his military enlistment (16) _______________________________. Tell your tutor your life story starting from your birth to the current day. Try to use some past perfect sentences. What are some hobbies you’ve always enjoyed? What are some pet peeves that you have always had? (1) He has lived here for three years. (2) John has taught English in Bogotá, Colombia. (3) My parents have missed the train. (4) You have eaten all of the cake. (5) They have not bought a house yet. (6) We have not gone on a vacation in three years. (7) His friend has not worked for one year. (8) Her boyfriend has not graduated from the university. (9) How long has your mother been sick? (10) What have you done today? (11) Has John talked with his mother today? (12) Where has your brother been all week? (13) Has he graduated from high school? (14) Has John lived abroad in Chile? (15) He has worked for Warner-Lambert. (16) John has completed his military enlistment.